Each summer, winter accumulations of snow in California’s various mountain ranges begin to melt. As they do, millions of liters of stormwater flow groundward, refilling aquifers and reservoirs while quenching farmland. When this much water falls from the mountains in an abbreviated period, it can spell disaster for those living below, as was almost the case earlier this year beneath the Sierra Nevada mountains. Additionally, the sudden drop in water weight on the mountains — and the fault lines beneath them — can lead to more frequent earthquakes during the snowmelt period, new research from the University of California at Berkeley finds. Researchers behind the study first sought to measure the pressure that snowpack exerts on California’s fault lines each winter. Using 661 hyper-sensitive global positioning system (GPS) sensors located around the state, they found that snowpack weight pushes the Sierra Nevada mountains underground by about 1 cm (0.4 in.) on average each winter. 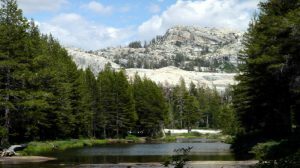 A research team from the University of California at –Berkeley found that the weight of winter snowpack depresses the Sierra Nevada mountains by about one centimeter each year. From late spring through early autumn, that snow begins to melt, removing weight from the mountains. 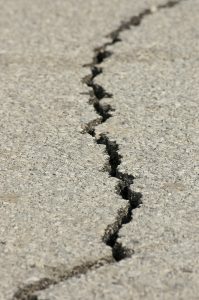 The researchers surmise that this seasonal shift in pressure could lead to more frequent earthquakes in California. U.S. Forest Service. When the snow melts, the mountains rebound upward, causing considerable stress to the fault lines beneath them as the earth’s crust “flexes,” the study says. The result is a sharp uptick in the average amount of small earthquakes from late spring through early autumn. While most of these earthquakes hover around magnitude 2 on the Richter Scale — not severe enough to be felt by humans — the researchers uncovered a close correlation between seasonal changes in fault-line stress and the number of small quakes detectable via seismograph. By comparing recent observations with GPS data from 3600 California earthquakes of varying intensity that occurred between 2006 and 2015, the researchers confirmed that earthquakes were most frequent when snowmelt-related stress changes on fault lines were at their highest. Studying records of historically large earthquakes of magnitude 5.5 or higher that rocked California as far back as 1781 also support their findings. A somewhat larger number of severe earthquakes occurred during the warmer and wetter months of the state’s annual water cycle. Researchers found a correlation between earthquake frequency and snowmelt period that spans beyond just the Sierra Nevada range. While their findings do not establish a clear connection between snowmelt and earthquakes, they offer scientists a better understanding of how fault lines shift. Pixabay/Creative Commons. While these findings indicate a correlation between melting snowpack and earthquake frequency, Johnson and his team caution against assuming causation. They also emphasize that their results are not broadly generalizable, and that fault mechanics in California may operate differently than faults elsewhere. Snowmelt’s direct effect on seasonal earthquake frequency is very slight, and is not the sole contributor to fault-line stress. At most, study results find that water-related fault-line stress drives up the likelihood of earthquakes by only a few percentage points, but that the findings offer scientists a better understanding of how faults rupture and how earthquakes in California are triggered. “This study supports the notion that the state’s faults are critically stressed so that these small perturbations can affect the earthquake cycle and sometimes promote failure,” Johnson said. Read the full study, released June 16 in the journal Science.